It has been pouring down hard and heavy these past couple of weeks in California, San Jose to be exact. It seems like there are five storms passing with heavy rain one after another (so I've heard). I think this is the longest rain I have ever seen in this area for the past eight years if I remember correctly, when I moved here. I have never liked cloudy, rainy weather. Weather affects your mood, well, at least for me :). While on the other hand, I'm all about sunny warm weather. Sun makes me happy (not scorching hot though) and excited. But fortunately (or is it? ), I'm inside an office building with a stable temperature everyday, so the rain doesn't really affect me all that much, except when I'm going out to lunch, weekend, and when I got home from work of course. Believe it or not, I woke up earlier than usual when it rains at night. The sound of the rain hitting the window next to my bed easily wakes me up bright and early in the morning (in this case, dark and early :D). Anyways, the bad weather makes me longing for something summery, or maybe tropical. Although it wasn't too long ago that summer had passed, but I already miss the smell and taste of berries, cherries, peaches, mangoes, ... It also happened to be San San's birthday last Wednesday. Although weekday birthday is never good for me (if I'm making the cake), but I tried my best to plan my schedule accordingly. I had also been wanting to lay my hands on passion fruit, in terms of creating something with this tropical and exotic fruit. Back in Indonesia, we can easily find this fruit at the grocery store, but it was a pain to eat or to extract the juice, so I didn't really care so much about it, but that was before I started making cakes. I couldn't even cook rice in a rice cooker at that time (can you believe that?)! 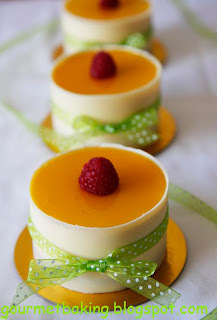 Now that I'm into cakes and desserts, passion fruit has been one of my most-wanted items :D and I was so excited that I found a baking supply warehouse near San Fransisco and they also sell to individuals! They do carry passion fruit puree as well as tons of many other stuff, so I got that a week before the bday. 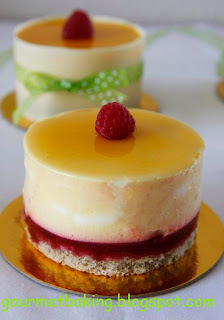 It only seems appropriate to match passion fruit with mango, and raspberry was also came to mind. Mostly because they have floral-y or tropical smell that I think compliments each other a lot. 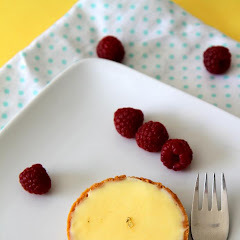 I also paired it with white chocolate mousse to balance out the flavor and two layers of almond joconde that have been brushed with Grand Marnier as the base. It might look like too many things going on in one cake, but I love texture and complex flavor combination, although at that point I really don't know how well it will turn out. I was pretty surprised to find out that the passion fruit puree was really sour and very liquid-y in terms of texture, almost like water although not as much. I have never used passion fruit in any of my baking before so I didn't know what to expect. I put LOTS of sugar to sweeten the puree but it seems like no matter how much I added, it was never enough and I didn't want to add more to it as it was almost the same amount of the puree itself. I had so many difficulties making the mousse as the mixture was so thin (before the gelatin sets) and the mousse was leaking from under the cake ring. After much frustration, remade the mousse to made up the lost amount and put it in the freezer to set, I went to sleep as it was already late. As predicted, the mousse was on the tart side, a little to tart for my taste in fact. The mango wasn't helping either as it wasn't sweet enough, which is expected I guess since it's not the season for it yet. Good thing the birthday girl likes tart stuff, but it might be too much for some of my friends :D. The gelatin wasn't quite enough to set the mousse as it was a little too soft. So, I put white chocolate fence and a ribbon around it to hold the mousse. At that point, it didn't look too bad, in fact, I think the white chocolate and the green ribbon added another dimension to the tropical theme :D. My friends were all agree that the cake was tart overall. I guess, it wasn't an ultimate success, but hey experiments don't always turn out so perfect, do they :D? I definitely want to play more with passion fruit and still curious with it, somewhere along passion fruit chiffon, or mix it with white chocolate ganache for macaron filling, somewhere along that line and I can't wait to have the ultimate passion fruit cake/dessert! I brought the mini cakes to work and let my coworkers tried it and surprisingly, they liked it! The textured firmed up a little more and I guess the flavor blend in more after a few days. I don't have the picture of the inside of the cake, but I left one cake "undecorated" so you can see the layers that made up the mini cakes. 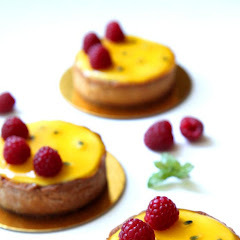 There's white chocolate mousse layer in the middle of the passion fruit mousse, you can probably see it from the white streaks in the picture below. I LOVE your blog! everything looks so delicious! I just wish you would post recipes and how tos. 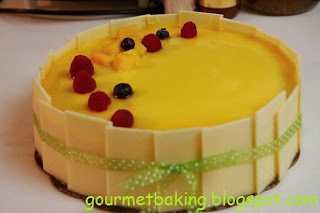 I found your blog 2 weeks ago when I'm looking the recipe for mango pudding. bole minta resep kue ini ato tiramisu ga?? This is so beautiful!!! How did you make the white chocolate fence? Laura: the white chocolate fence is pretty easy to make. I just measure the dimension that you want(height and the circumference) of the cake, adding a little extra for the length, and cut an acetate sheet. 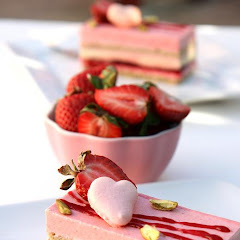 Melt the white chocolate, wrap it around the cake, and refrigerate. You can peel it off easily once it's set. 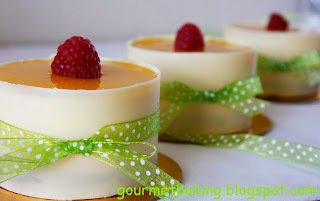 Can I ask, did you use chefs rings to make these and if so how did you get the little mousses back out again because they look so perfect. Sounds wonderful, and looks delicious! But where's the recipes? I didnt write down the recipe cuz i wasnt satisfied with how it turned out, it was too sour. Hi Tammy: As I said on my previous comment, I didn't write down the recipe because I didn't quite like how it turned out. 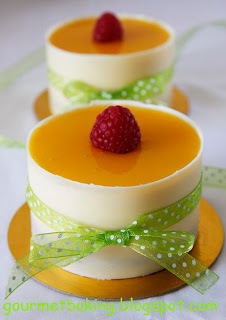 How did you make the passion fruit glaze on the top? It looks delicious!